Ananka's Diary: And the Finalists Are . . .
Alas, only five t-shirts could be chosen as finalists. The experts looked for designs that were creative, fashionable, and different from anything else they had seen. Now it's your turn! Comment on this post to vote for your favorite. One vote per person only, which means PLEASE DO NOT VOTE ANONYMOUSLY. If I suspect cheating, I will contact the FBI. Then I'll figure out what to do. But you can rest assured that CHEATING WILL MAKE ME VERY UNHAPPY. Also, please use your imaginations. 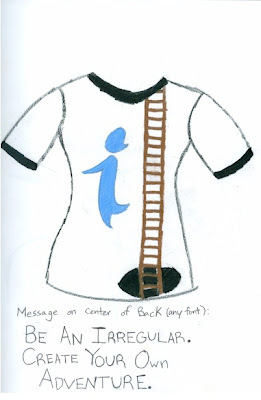 Some of the designs are rougher than others, but all the shirts will look great in the end! I vote for the Third one. Its cleaner, but the competion is strong. Still, entry 3. I'll go with #3 X3 then!! I like entry number 3. I think it is the most mysterious. Will you put up some of the other good designs that didn't make it? Like maybe *wink wink* one with a loch ness monster, hand, or city on it???? I liked them all, but entry 3 is mysterious. I loved it. Number 3 is clearly the strongest entry no doubt i vote for 3.
entry #4. wish i got a chance to get mine in. darn. congrats! Ehh maybe next time! But everyone did a super job! (plus I'm a writer not an artist haha) I must say I'm stuck between 2 & 3 but I going to go with 3. Congrats every one on a super job! Congrats to all the finalists! They're all really good....but I'm going to go with #2, very clever. Yes, Kirsten, can you post some honorable mentions. Even if they're not mine, it's fun to see all the designs. as long as it were centred and the background were cut out properly. and there were a different font. But I love the idea. I really like #3, but I think #2 is the cleverest. So my vote goes to #2! Anonymous: You didn't have to draw on a t-shirt. It's just a coincidence that the five finalists did. There were several other ideas that came very close that weren't even drawn at all! 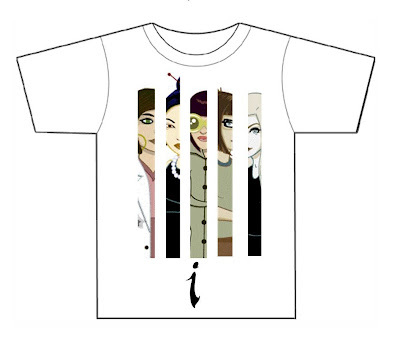 i love #3 so my vote is 3.i would buy it if it was a real shirt, so creative! everyone vote for three!! 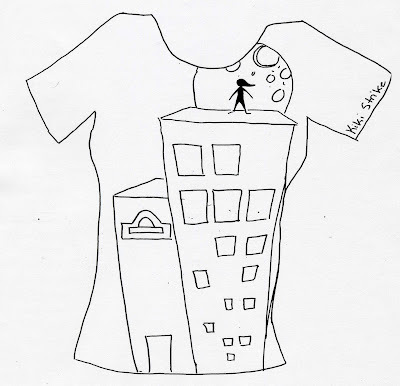 it said we could write or draw your idea never to put it in a tee shirt desine! but congrats to evey 1! oh I LOVE entry 2! my vote goes to that one! The t-shirt does not need to show Kiki Strike, but it must be in the spirit of the books. The design can feature an illustration, photo, or even a phrase. So it doesn't matter if you prefer to write or draw--your talents can be put to work! OMG! they are all so good! But my pick has to be #4! No! I didn't make it! :( oh well...a spy never cries. But hmmmmm.......#2 is definitely the best! Go #2! I like three. It is very cool. #1.....that's all i have to say. I like Entry#4 the best, but they were all great!!! 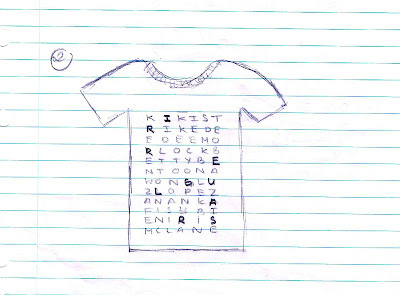 Also, Kirsten, can you show some of the other entries? Just to see what other people came up with. Oh, I almost forgot. Who were the judges? Weren't you going to tell us? Hmmmm...my vote goes to numero 3...truly clever design! AAAAAAAAAAA! I forgot to submit my entry! Anyways, all of these were great, but I liked #1 the best! I love them all! Number two is fabulous but doesn't have much to do with Kiki Strike. I have to go with number three. Hey, by the way, I think Iris McLeod needs to be included sometime! and with 5 you have to know the books to get it! So I pick 5..only the true readers and lovers of your story would understand it! i wish i could wear it! i vote for the third one! OK, #2 is AWESOME! I could definitely wear that to school. I like #3 and all, but #2 has my vote for sure! I like #5... the ladder makes me think there are mysteries undeground to be solved. And I like the call to action! I like #5... the ladder seems to lead to mysteries underground to be solved. And I like the call to action! Number ONE!!! It's awesome. If it doesn't win, I might copy the design and make it myself (or not. I'm not good at tracing). Darn it! Oh well, these are all SO great!!!! I like 4 for sure though! BTW, I agree I'm a fan of the idea of putting up honerable mentions! And also all you guys who are angry about having the t-shirt be a background, it didn't have to be, it's coincidence that it was, so calm down? It's really nice of Kirsten to make this contest for us! Hey I've tried this 4 times but it doesn't seem to post... I'm trying to vote for #5 !!! I vote for number 3!!!!!! NO CONTEST WHAT SO EVER!!!!!!!!!!!! #3 is DEFINITEly the best and I strongly believe that #3 should win so vote for 3!!!!!! i chose number 2 but number 4 is my second favorite... Where's Luz on the 3rd one? what do you mean "it doesn't have much to do with the books?" You need to read the actual Ananka's Diary. (check the archives of this blog). i would have to vote for number 3 because it is very creative and modern (my two favorite qualities in art). i was kinda torn between 2 and 3 but 3 represents the awesome series of Kiki Strike's adventures better. 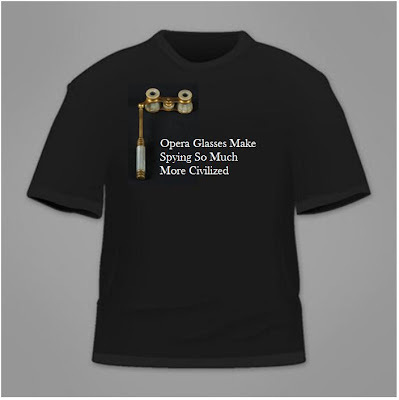 I don't remember there being opera glasses in the books. I vote for number 5. Is is clean and simple. All are excellent but I vote for #5. It is the most creative and imaginative! Good luck to all! Mike in Westchester says all are excellent. I vote for #5. It is the most creative and imaginative! Good luck to all! I vote #1 it's well drawn and thing is I know that I've drawn it before in my math book. I wouldn't mind if the others won though. I hope there can be honorable mentions!! I luv the retro T #5! It uniquely depicts many of the original elements of the book! WOW!!! I vote for entry #3. I vote for entry 3. I vote #3 because it just is a very simple, neat, way to represent the characters in the series. But she did leave out 1 of the characters (though it doesn't really matter. I still LOVE the t-shirt). I vote for # 3. its cool, and very modern looking! Hurray for #5!!! Pretty sweet, and cute cartoony and everything! Oooh, I liked all of them. :3 I noticed that a lot of people are voting for number 3, which I thought was good, but it's missing Luz Lopez D: I think that if that one is picked (which it looks like it will, Luz should be added. I like #3 if you would add Luz to it! Okay yes, i did make Number 3, and if possible i would be morre than happy to add luz lopez....I made this shirt ten min before midnight, and wasnt thinking straight!!!! Luz is my favorite...And i will be more than happy to add it if i win!! Everyone: Please, no anonymous votes! #3 i absolutely adore #3 its just fantastic briliant guys #3 is perfect vote for 3! I love the second one!!! Tracy votes for the fabulous design of Entry #5. #3 RULES! IT ABSOLUTELY RULES!!!! I love tee shirt number 5. The drawing on the front and words on the back are just....fabulous ! #3 rules!!! It absolutely RULES!!!!! OMG!! #3!!! #3!!!!!!!!!!!! NUMBER 3 all the way!!!! NUMBER THREE!!! #3!!! OMG!! IT ROCKS!!! Oooh La La! Number three is tres chic! I heart number... THREE!! that's one vote for number 3. I would like to place a vote for number three please. #3 - love the T-Shirt. I vote for number 3! Very nice! I think #5 is the best! can't you tell?? #5 is the best! i like #5 so i vote # 5 obv. Yo idk why you peeps votin for 3? it aint got nuttin but wierd faces. I don't like number 3 and 5 looks good. My vote is for number 5. 2's interesting but i like 5 better i vote 5.
hey there! this girl says 5! I think 5 is the Cutest! Guys i need to vote 3, cuz its nice, and clean. And its obvious that the person that made 5 is chaeting...And thats no right. All of them say the same thing, and its not right. Number 5, stop it. KKirsten doesnt aprrove of cheating so why? STOP: It isn't cheating. I'm sure everyone had their friends vote for them. But it has gotten to be a bit much. This contest was for those of us who spend time on the blog. Question For Kiki: I had all my family vote, and friends, now all their votes are gone... I counted the votes, and i am not wining. Beter Luck next time? Its okay, everyone worked very hard so congrats to all of you! Rosemary: The rules have changed, so your family's votes will no longer count. However, no votes have been--or will be--removed from this post. If you don't see what you're looking for, you should look again. Thank you very much! I will be watching every second till midnight! I had posted on fb that i was a finalist. My friends voted for me and then apparently then sent it to their friends. I didn't know this until now. I am really truly sorry! I didn't mean for it to get out of hand. Sorry again! Chloe: No worries! I figured something like that had happened. So don't worry about it at all. Congrats on being a finalist! hope its not too late, its 10:49 pm where i am. i say #2! !